EA Sports is no longer tethered to the virtual world. The brand, known for its celebrity-driven sports games like Madden and the Tiger Woods golf titles, is branching out into airports and cruise ships. This week, the company is opening its third “EA Experience” airport venue in Salt Lake City (following Charlotte, N.C. and Oklahoma City), and the company recently inked a deal with Carnival Cruise Lines to put EA-branded bars on all of the company’s cruise ships. The goal of the locations is to link the EA brand with real-world sports, Erb says. 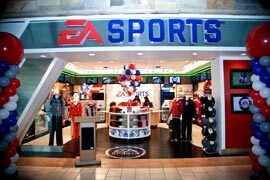 The stores, created in partnership with The Paradise Shops, feature amenities such as chairs and recharging stations for digital devices, as well as a place to purchase gear from the local sports teams, and EA games and branded merchandise. Similarly, the bars on the boats provide a way for travelers to keep up with their favorite teams and sports while away. Moving forward, Erb says, the company will continue to evaluate its current initiatives (including the stores and bars) and create experiences that build positive associations with the brand, which, hopefully, will translate into sales.